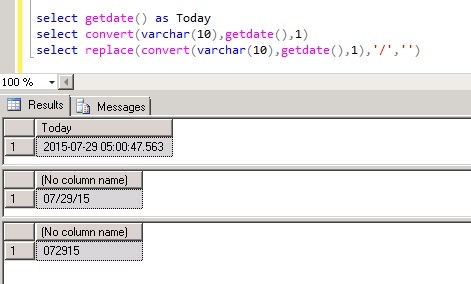 If you ever needed to convert datetime field to MMDDYY format in sql server, read on. I am going to present you a quick tips on how to get date or datetime field in sql server in MMDDYY format. Let's do it step by step. First of all I would like to remind you to learn how to convert date to different date string using Convert function of ms sql server. This will prepare background for the technique used in this article. All the steps are put together below. Now we have successfully converted datetime field in sql server into MMDDYY format.